Royal Navy teams arrive today. 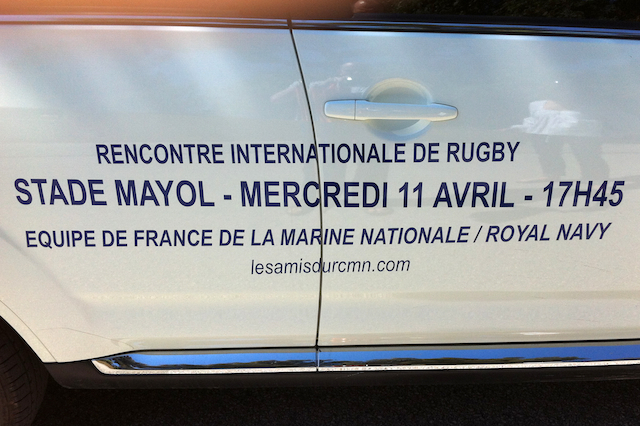 Marine Nationale have enjoyed a week on intense preparation. Match day looms for the eighth meeting of the men and the ‘second’ first meeting of the women’s team. An all french semi final line up in the Amlin cup where Harlequins, Exeter, Wasps and Scarlets all succumbed to french opposition does not bode well for the British fortunes on Wednesday. In the Heineken cup it was not quite as bad. Although Saracens lost to Clermont at least the celts of Edinburgh took the game to Toulouse and were deserved winners. Their victory was build on excellent team spirit and raw determination but also on a simple but tactically astute game plan which never allowed the french side to get in to their majestic stride. The other welcome portent for the Royal Navy was the way Ulster stormed the Thomond Park citadel and deservedly booked their place in the semi final. At least one member of the Navy Rugby contingent will be ensuring that all who travel know about the victory and its significance. For the Navy they face their own Thomond Park in the shape of the Stade Mayol where it is forecast to be a windy and potentially wet day. A hostile crowd and a swirling wind coming over the South Stand should test the mettle of the team that Andy Kellett selects. Wednesday will be the eighth meeting of the two Navies and although the Royal Navy lead the series 5-2 they were well beaten the only previous time they played at Stade Mayol (3-29 in 2010). That score line remains the biggest winning margin in the series so far, in matches which have traditionally been close. However the Marine Nationale were unable to hold on to the Babcock International Challenge trophy when they had to defend it in 2011 at Plymouth Albion’s Brickfields ground. In what was probably the best match of the series thus far the Royal Navy returned to winning ways 17-10. 2011 was also the first occasion that the Royal Navy Rugby Union awarded caps for a match not involving the Royal Air Force or the Army. For those who have followed the progress of ‘Le Crunch’ it is a fair reflection on what has quickly become an excellent occasion and a great sporting challenge. 2011 in Plymouth also saw the RCMN(F) travel to play a match of 12-a-side rugby against RN(W). The venue was probably the most atmospheric venue possible with the game taking place on the pitch outside the historic Wardroom of HMS Drake. 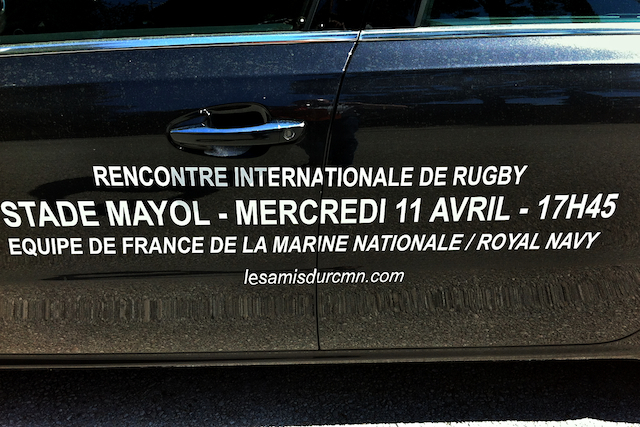 The match was decisively won by the RCMN(F) who returned across the channel savouring a 45-0 victory. Wednesday will be the first XV-a-side meeting of the two teams and I am sure that history will soon judge that the ‘série feminine’ will be as keenly contested as that between the men. Wednesday’s two matches is being well advertised around Toulon through the generous sponsorship of Peugeot and also in the local newspaper Var Martin. Hopefully the forecast poor weather will not prevent the Toulonnais from again turning out in their thousands for another feast of Navy/Marine rugby. The latest select Xv has been chosen by Royal Navy Rugby Union’s Chairman, Chris Alcock. As with those from Mike Connolly and Bob Armstrong it is sure to provoke debate. It can be found here.